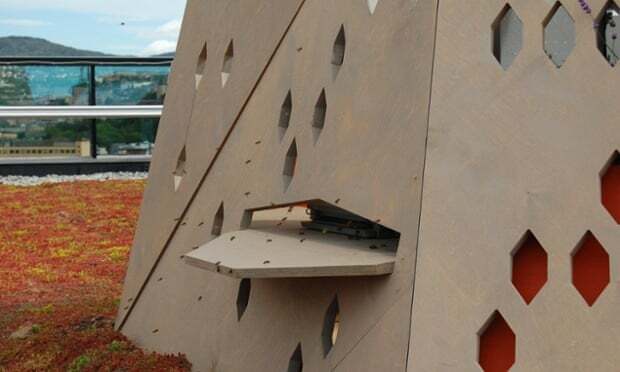 From flower-emblazoned cemeteries to rooftop gardens and balconies, Norway’s capital Oslo is creating a “bee highway” to protect endangered pollinators essential to food production. Participants in the project – state bodies, companies, associations and private individuals – are invited to post their contribution on a website (polli.no), which maps out the bees’ route across the city. On the 12th floor of an ultra-modern office block in the capital’s chic business district on the edge of Oslo fjord, a major accountancy firm has covered parts of its terrace in brightly-flowering Sedum plants and two bee hives. It houses some 45,000 worker bees, busily unaware of their smart-suited office counterparts enjoying their lunch just metres away. ← READ: Beekeeping on it’s way to being legal in Long Beach!